Fixture Booklet and Website for Local Village Community and Sports Clubs. By providing valuable skillsets for the greater good of a village cricket club and community in Kent helped in raising much need funding annually and created a united front for the cricket, bowls, tennis and stoolball clubs. 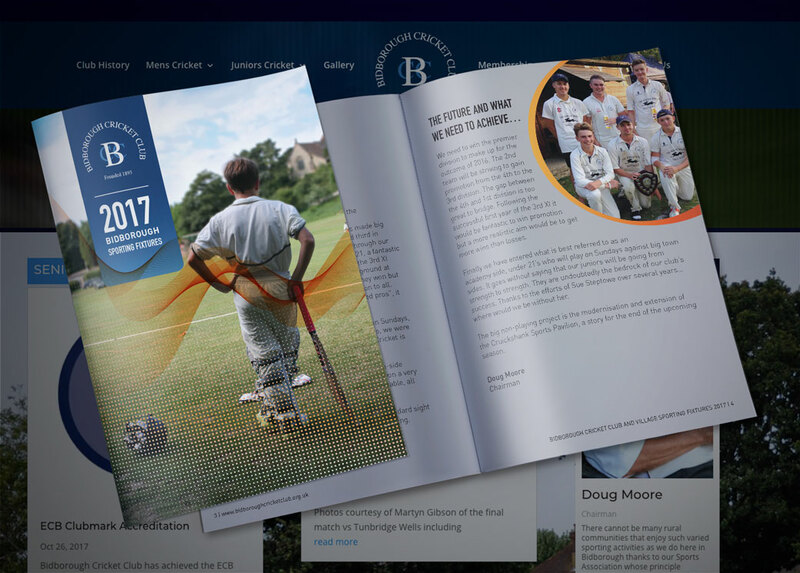 What initially started out as a basic Fixture Booklet for the Cricket club, soon progressed to include local advertisers plus fixtures for the wider sports clubs including tennis, bowls and stoolball. This soon progressed on to include a dedicated website profiling the sporting highlights and local news through the summer months. Over time this has become a much sought after communication tool for the entire village community. It soon became apparent that other local village communities could benefit from the same tools if accessible, easy to setup and cost effective. With this in mind, we have now created a templated version of the Community Sporting Fixture Booklet plus a fitting website template. Both of which are ready to be edited and loaded with relevant content. The website template in particular has not only proven to work successfully for a local village Cricket Club but has also been applied to the Sussex County Ladies Golf Association. To make and enquiry on how your local village and sports clubs could access these templates click here.